While it’s not required, graduate Computer Science student Henry Idar recommends Currency Collector VR be played with a virtual reality headset. For 20 years while in the Marine Corps, Henry Idar earned a reputation as a solid mechanic, but he has felt the draw of computers for a while. After earning his bachelor’s degree in Computer Information Systems in 2015, he moved on to St. Mary’s University’s master’s program in Computer Science. Idar will graduate in December 2017. When he does, he’ll leave with a virtual reality game under his belt – and becomes the first St. Mary’s student to create a virtual reality game as his comprehensive project. His game, Currency Collector VR, is available for free as an app on the Google Playstore for Android phones. It does not require a virtual reality headset, although Idar recommends one for the full experience. Headsets can be relatively inexpensive, such as the Google Cardboard, which is less than $20. 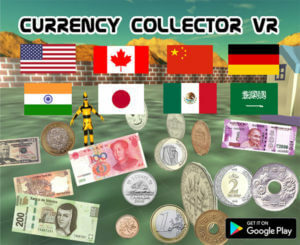 Currency Collector VR is available for free on the Google Playstore. He described Currency Collector VR as an educational game that teaches players about currency from around the world. There are eight worlds in the game, each representing a different country, including Canada, China, Germany, India, Japan and Saudi Arabia. The goal is to collect a predetermined amount of currency — in the form of three-dimensional floating coins and bills — which can then be used to buy gold bars to unlock power-ups, such as a magnet and a skydiving sequence. Players must also avoid colliding into robbers lurking in each world. For added educational experience, each country’s national anthem plays in the background as players walk around, and in the center of each world is a block that explains four major landmarks found in the selected country. Idar said the game took him about 20 hours a week over an eight-month period to finish. He built the game using a Unity 3D game engine. 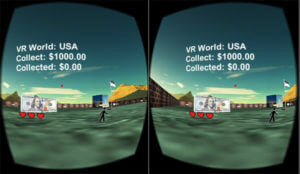 An in-game screenshot of Currency Collector VR. 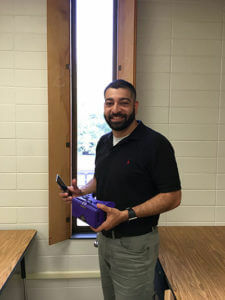 Idar retired from the Marines in July after 20 years, and with a wife and two sons, aged 14 and 10, his family has kept him busy when he’s not on campus. Once he graduates in December, Idar plans to enjoy some free time, but he isn’t ruling out a second career. “I believe all video games are educational in some way,” he said.